Last week I dropped in on Postcard Teas, the amazing little teashop in London run by Tim D’Offay. At the moment he has an exhibition of traditional crafts from Japan, and when I visited I met Takahiro Yagi, an artisanal maker of teacaddies from Kyoto who is the SEVENTH generation of his family to work in this business. 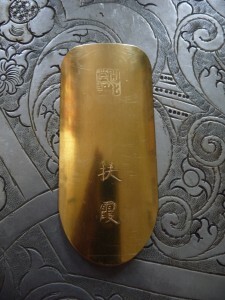 He was showing handmade caddies made from silver, copper and brass, and lined with tin – beautiful. We drank a delicious roasty oolong tea from Wuyishan in Fujian Province – just one of the fine teas that Tim selects on his travels to China, Taiwan, Japan and India. As always, a visit to Postcard Teas felt like a tonic, and I forgot about the wind, rain and darkness outside, not to mention the frenzy of harrassed shoppers in the West End. 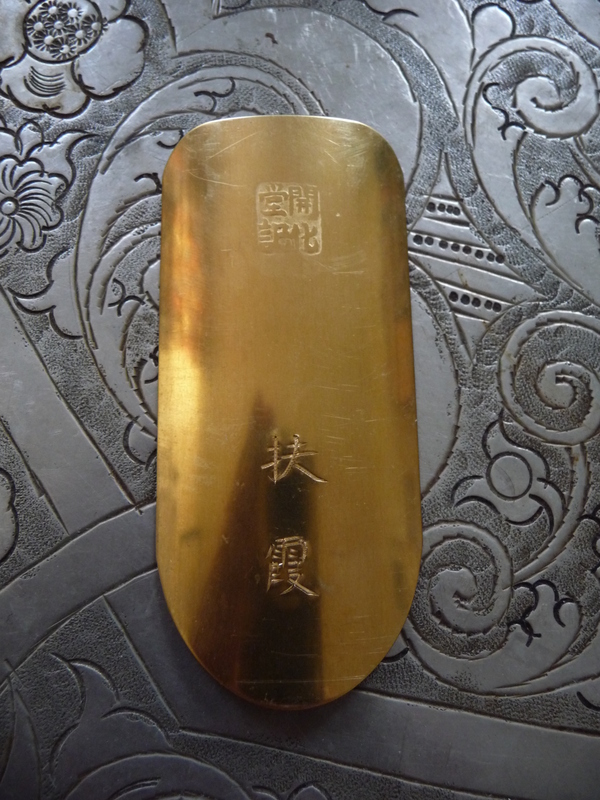 When I left, Takahito Yagi presented me with a brass tea scoop, which he engraved with the characters for my Chinese name, Fu Xia! 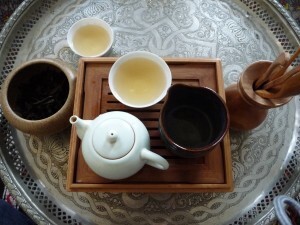 This morning I had a good friend over for Chinese breakfast, and afterwards we drank one of Tim’s teas (a rou gui, also from Wuyishan), using, of course, my new tea scoop for the tea. Pictures below of the tea scoop (taken, somewhat inappropriately, against the background of a Moroccan tea table!) and of the tea things I use when it’s just me, or me and one other person. 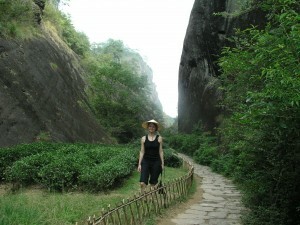 The photograph above is of me walking through the teafields of Wuyishan.